New iPod touch with HD video ! 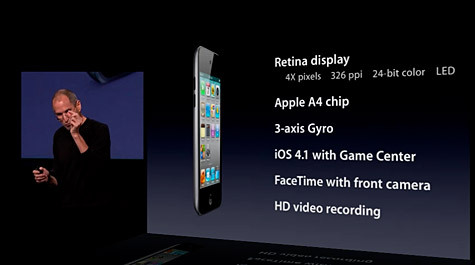 New iPod touch with HDR and HD video ! Taking a page from the standalone camera world and from the Pro HDR app, the iPod Touch and iPod will gain the capability to take HDR photos, which stands for high dynamic range. It's an added step that will help you get the best photos, particularly when the light may be challenging. When you tap the option on the screen, the device's cameras will take three photos in rapid succession. One image with normal exposure, another will be underexposed, and the third will be overexposed. To finish off, the devices will combine the shots into a single HDR photo. You'll find it in your photo gallery along with the normal image. Last edited by jogiba; 09-01-2010 at 03:52 PM. I pre ordered one two days ago. the inclusion of the dual cameras for ‘face time’ over wifi was a seller for me. I was hoping for that in the new ipod touch when I first saw it for the iphone 4. I don’t need a mobile phone, so cant justify the price of the iphone per month, to have these features. but I use my ipod every day, so ‘face time’ is great for me and my fiancée. I also ordered one, the 64GB version since I plan on using it for HD video that could be uploaded to youtube using it's 802.11n wi-fi.